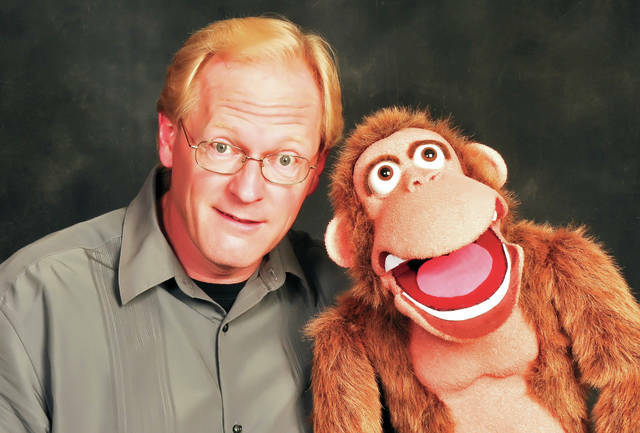 Provided photo Ventriloquist/juggler Mike Hemmelgarn will bring his act — including furry friend Bongo and other characters — to Taste of the Arts on Friday, May 10, in downtown Piqua. PIQUA — Ventriloquist and juggler Mike Hemmelgarn and Amanda Gold’s Tumble U Acrobatics will be featured for the 25th celebration of Taste of the Arts on Friday, May 10. Both acts will be performing between 5-9 p.m. at the intersection of Fun and Friends. Hemmelgarn, a performer of 25 years, will be using several characters during his ventriloquist act: Tyson, a paranoid chicken, a wooden soldier named Melvin, a 92-year-old lady named Rosie and a monkey called Bongo. Audience participation is part of Hemmelgarn’s act. “My favorite audience participation part is using two volunteers to become human puppets. I give them wild character voices that are the opposite of what you’d expect. It really is hilarious,” he said. Amanda Gold is in her fourth year of coaching Tumble U Acrobatics, which is housed in Piqua. There are 14 members of the group, ranging in age from 5 to 23. The group competes in women’s pairs, mixed pairs, trios and men’s pairs throughout the year. Tumble U has won regional and state titles and captured a national title in 2018. Tumble U will perform at 6 p.m. demonstrating group routines along with individuals, pairs and trios. Taste of the Arts also highlights area artists, offers taste size portions of popular menu items from local and area restaurants, children’s activities and art demonstrations throughout the evening. For more information about Taste of the Arts, call Mainstreet Piqua at (937) 773-9335.
https://www.dailycall.com/wp-content/uploads/sites/30/2019/04/web1_hemmelgarn_cmyk.jpgProvided photo Ventriloquist/juggler Mike Hemmelgarn will bring his act — including furry friend Bongo and other characters — to Taste of the Arts on Friday, May 10, in downtown Piqua.